The Samuel A. Goldsmith Award, now in its 24th year, is awarded annually to exceptional young professionals who have shown outstanding performance in their work at a Jewish agency in the Chicago area. This year's award was presented at the 2011 Jewish Federation of Metropolitan Chicago to Becky Adelberg, Executive Director of Chicago's American Zionist Movement, and to Caryn Peretz, for her work as Director of the JUF's Young Leadership Division. 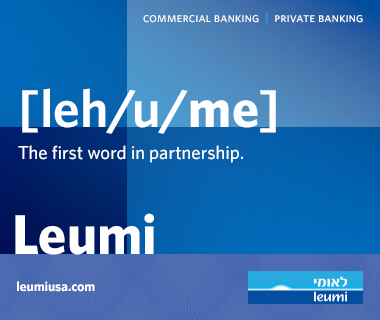 (Peretz has since been named an Assistant Vice President and Director of Contributor Account Relations.) See below for an excerpt from Caryn’s acceptance speech. Thank you. It is a tremendous honor to receive this award today. It is especially meaningful to me that I am sharing this special day with our revered President Steve Nasatir as he receives the Julius Rosenwald Award. Thank you Steve, for leading this community, and more personally, for your kind words and all of your support. I am privileged to devote my career to an organization that places great value on young Jewish professionals in the community. Mazel Tov to my fellow Jewish communal colleagues Becky Adelberg, Mara Baumgarten and Josh Daitch. I have had the pleasure of working closely with Mara and Josh over the years and I couldn’t have selected more deserving recipients of the Davis, Gidwitz and Glasser Young Leadership Award. I recently celebrated my 10-year anniversary of graduating from college. My Senior year, after returning from a year abroad at the Hebrew University in Jerusalem and living on campus at the University of Wisconsin during the outbreak of the second intifada, I knew all I wanted to do was work in the Jewish community. Concerned friends and family asked me, “is there a future career in the Jewish world?” Indeed there was. 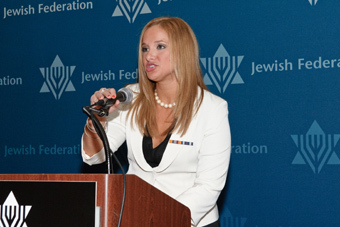 My Jewish career began at JUF as a YLD Campaign Associate. A common question that Jewish communal professionals are asked is “is that your full time job?” After 10 years of working in Chicago’s Jewish community, I can confidently reply that my job is so much more than a “full-time job”, and I don’t just mean the late night hours. I mean that working at JUF has given me a community, a tradition, a life-long passion. Four years ago I returned to JUF not realizing that as much as I gave to the job, I would get back even more. Winston Churchill said “we make a living by what we get, we make a life by what we give”. JUF has allowed me to accomplish both at once. Thank you to Audra Berg and Beth Cherner for this nomination. Audra – your guidance and mentorship has provided me the opportunity to learn and grow at JUF. You have always helped me find meaningful professional experiences and modeled the highest levels of professionalism that I always strive to emulate. Beth – you have gracefully and successfully led our fundraising efforts through good times and bad. Your leadership and support through the years have meant so much to me. Thank you to Rachel Sternberg for helping me find my future path in this organization, for being such a strong and positive role model and for being the kind of supervisor who both challenges me to be better and gives me the support and guidance needed to reach those heights. I have already learned so much from you and am truly grateful for the opportunity to work together. I am a product of my heritage and my family’s history. I credit my grandparents with everything I have done professionally since college. They were always my Jewish role models and figures of strength, courage, and survival. Of the many lessons my grandparents taught me, Zionism by example was one of the most formative and important. My grandfather was a Holocaust survivor who personified the path of the Jews from darkness to light, from Eastern Europe to the State of Israel, which for him was truly the Promised Land, a refuge and a safe haven when all other doors were closed. He made it to Palestine with the help of the Jewish Agency and fought in the Jewish State’s War of Independence. Working in this community has allowed me, in a very different way, to carry on my grandparents’ mission and the tradition of securing the Jewish future. I am proud to be wearing my grandpa’s army ribbons today and I know that he would be very proud to see that I have chosen a career building a better and stronger Jewish community. Thank you to my parents for raising me in a home that emphasized a love of Judaism and Israel. Thank you to all my friends and family that are here today – you are my community and your constant love and support means the world to me. I am so proud to work for an organization that carries on the tradition of generations that came before of taking care of our community and those in need. This has been the secret of Jewish survival throughout history. Thank you to JUF for creating miracles every day, for building a Jewish community in Chicago that I am proud to be a part of, and most of all, for giving me the opportunity to turn my life’s passion into my full time job. Ten years ago, I could have only dreamed that I would be standing here having built a career path for myself in the Jewish community. While this award represents the work that I have already done, it is just the beginning of my professional journey, and I look forward to the endless possibilities that lie ahead. There is no place else I would rather be.